Oh the bane of piggybacks.... Closed loop tuning using the O2 map. The most finicky of settings! I can't promise to solve all your problems, but hopefully give you some insight and some 'gambatte' with regards to this challenging issue. The way I initially setup my O2 map was by following AEM's guide (1NZFE uses a narrow band O2 sensor). The guide has an excellent overview on O2 tuning, so have a look at that! Remember, you should only be tuning the O2 map for Close Loop; there's no point in Open Loop as the factory computer does not use the O2 sensor to calculate fuel delivery; it usually just pumps out a constant output in accordance with its base fuel map. O2 map tuning is essentially Fuel Trim "tuning": making sure the tune you apply doesn't cause factory fuel trims to fluctuate too much. This is the key goal for O2 tuning! Your OBDII tool that can read the factory computer's fuel trims and open/closed loop indicators is absolutely a requirement. In the vacuum region, you are not making any boost so there is no need to add more fuel and hence no requirement to adjust the O2 map. In the picture above, I have also added another region to our map that I've dubbed the "dead zone". The dead zone is a portion of the map where, under normal operating conditions, the motor should never be able to get to. For example, from revs 0-3k; it is not expected that the motor will get to MAX boost, not possible for my turbo anyway. 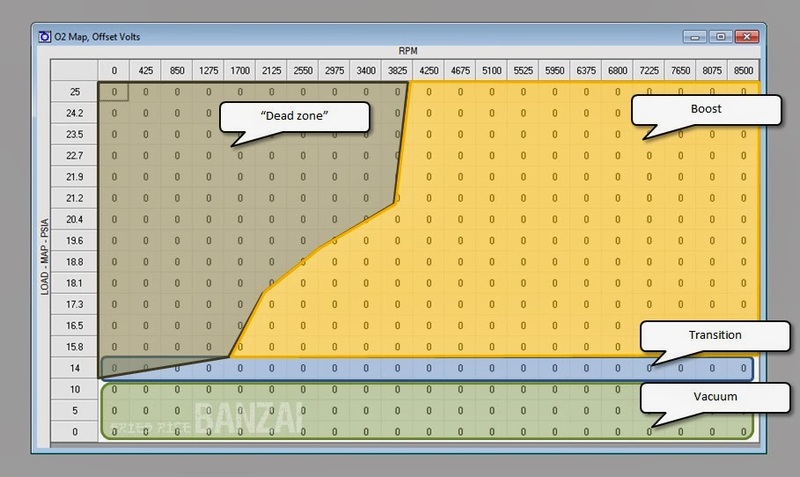 Look at your own map and determine from your RPM and load ranges what is indeed your dead zone. It's still a good idea to put values in there in the unlikely event the motor will go into that region, but don't be tinkering around that area as it's most likely not a region of concern. Now, the motor uses the O2 sensor to deliver an optimum amount of fuel in accordance with the base fuel map, usually stoich. However, at wide open throttle or at a certain increased load and RPM conditions, the motor switches from Closed Loop to Open Loop as it doesn't care about accuracy and falls back to its own fuel map. This transition and its key drivers is what you need to look out for when tuning! At partial throttle with lower loads and low RPM, most likely the car would be making boost but would be in Closed Loop. As the revs and load builds, there is a switch to Open Loop and suddenly the fuel signals becomes constant. Keep in mind that at wide open throttle, even at low-medium RPM, the above depiction becomes irrelevant as the factory computer would be in Open Loop. To reiterate, wide-open throttle usually puts the factory computer in Open Loop; but check and confirm the behaviour of your application! So now we've narrowed the problem down to only that redish region in depiction above. Not so hard now huh? LOL not really.. When it comes to build your map, usually you would start with Open Loop tuning and build your fuel map. Then when you have attained your target AFRs, fuel trims, power etc; you can then work on your Close Loop tune. Setup fuel values in your fuel map. Adjust O2 map to minimise fuel trim fluctuations. The O2 sensor needs time to warm up before it can provide reliable measurements to the factory computer. So always do your tuning on a warmed up car! In essence, O2 tuning is about minimising fuel trim fluctuations, so always check your fuel trims! If you are getting frustrated and trims seem to be all over the shop, reset them and start fresh by resetting the factory computer (usually power cycling it). Then, warm up the motor and re-tune. If your fuel trims at idle is already fluctuating significantly, this will significantly affect your closed loop tuning. Try to determine why your idle is too rich or lean. E.g. vacuum leak? new injectors pumping too much fuel? Make values between cells transition smoothly and gradually. Don't put one cell as, for example, 10(%) and then a nearby cell as 25(%). The erratic jump may confuse the factory computer. Try to work with your factory computer, instead of against it. If it wants to lock down a long-term fuel trim at a certain point but you have your target values with little swing in short term fuel trims, then leave it be; don't need to try to tune out long-term fuel trim. Even if it resets, the short term fuel trim will bring back the long term fuel trim to that level anyway. I hope this overview and the tips above helps out with O2 map and fuel trim tuning. This is the most challenging part of piggyback tuning as you not only need to make the motor happy, but also the piggyback computer and the factory computer. Any comments, suggestions or your thoughts; feel free to leave a comment! The more pieces of info we all get, the more ideas we can come up with to help make piggyback and closed loop tuning a little less of a headache for all of us! Aw thanks! Yeah I'm considering of making another post about maps as it's basically all you see when tuning lol. Stay tuned! Yup, this whole post is about the O2 map offset table! Have another read! Basically, you need to set your fuel first, then adjust the O2 map to hold your AFR and to keep your ST fuel trims! The nature of the beast will prevent anyone from getting AFRs perfect and stable.. So if you can get it to a manageable state, then you're all good!! Hi there! Please ask via the comments so we can all learn! Thanks! So I have been running the aem fic6 on a turbo 2.5 jeep wrangler for a while. I thought I had the fuel map dialed, would go rich under throttle and lean under vacuum but i'm still geting hiccups at 2 to 3k no load that i cant seem to shake. Then last night i removed the battery. Reloaded my last tune and the computer was giving me fits. Had to load an old stock tune to even drive it. Heya! Ahh! 2-3k is about the middle of the transition between vacuum and boost, so the factory ECU may be getting confused if you have a too greater jump in additional fuel when you go into boost. Now, if you remove the battery, what happens is; the factory ECU clears its Long Term Fuel Trims and brings the factory tune right back to baseline. If you have been tuning on the factory ECU before this, then you could be adding too much/little fuel at the baseline maps! For piggyback tuning, it's good practice to do a full factory ECU reset by removing power to the ECU and let it sit for awhile (I like to leave it for like an hour to make sure it is totally cleared). Then with the baseline, do your tune. Just note though, at baseline, the tune assumes your car is perfect from factory. After awhile of daily driving there will be inefficiencies. So the factory ECU will immediately begin to adjust for these and will be evident when you check the Long Term Fuel Trims after a couple of drives. But that's fine, just take this into account when you tune. To assist with the 2-3k transition, make a gradual increase from vacuum to boost. So start adding fuel a little early like at 1,900 and then reach your target fuel value by 2,500 or so. Don't forget to adjust your O2 map accordingly just in case you're not in Open Loop yet and the factory ECU is still relying on the O2. Ah hey there! Aww I haven't thought about it! Been super busy lately so I haven't been able to write any new posts.. but if there's a topic in particular you're interested in you could always lemme know and I'll see what I can do! Thanks for popping by! 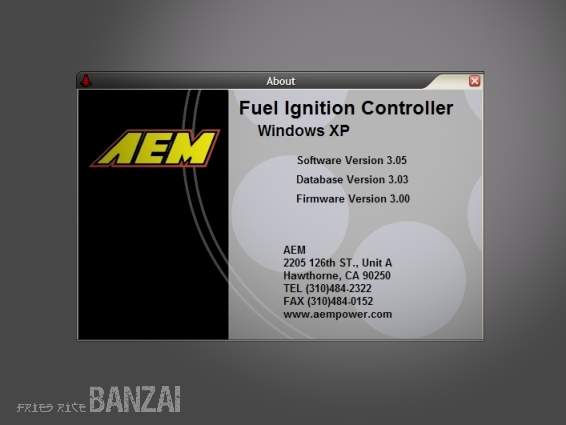 Tuning: AEM FIC Fuel Map Steps! Boost Breaking Brake Booster Benefits? When I was little, family friends used to call me Fried Rice.. Probably because I used to eat lots of it! So welcome to Fried Rice's blog! A wok tossed mix of ingredients that I like! One ingredient is eggs! A particular egg that I like is my tough little Echo Sportivo! Like your wok heated using an inductive stove? Well technology is also in the mix! A dash of reviews, seasoned with updates, garnished with DIY all served with amazing fried rice! Everyone has an escapism. For me its games! I hope to develop something cool and take you on a journey through my stories! Uh-Oh: AEM FIC MAP Sensor Died..